If you’ve never made shawarma on the grill before, you’re missing out way too much! 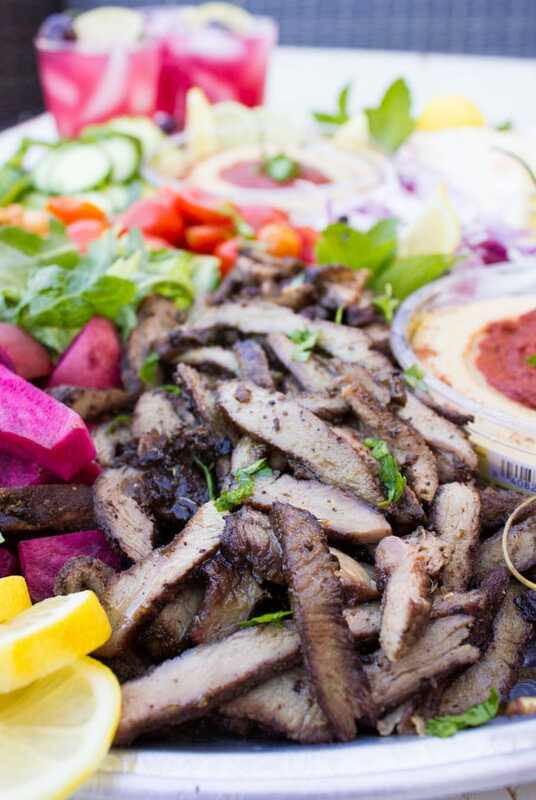 This succulent Grilled Lamb Shawarma Platter is a mouthwatering combo of flavors, textures and spice. Summer entertaining at its best! Today’s delicious recipe is sponsored by my friends at Sabra, makers of authentic and quality hummus! All thoughts and opinions are my own. Ok let’s start with choosing the platter components and why this combo of ingredients creates a delicious meal. So while I always mention that food is a personal thing and I encourage you guys to mix things up here and there, there are a few things you really shouldn’t skimp on! First of all, you’ll need to choose your shawarma spiced protein. It could be lamb (my all time favorite! ), chicken, beef or chickpeas (for a vegan option). 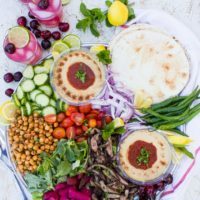 Today I’ve got you covered with shawarma spiced chickpeas and I’m also sharing the ultimate tricks to make authentic lamb shawarma on the grill! Hummus. 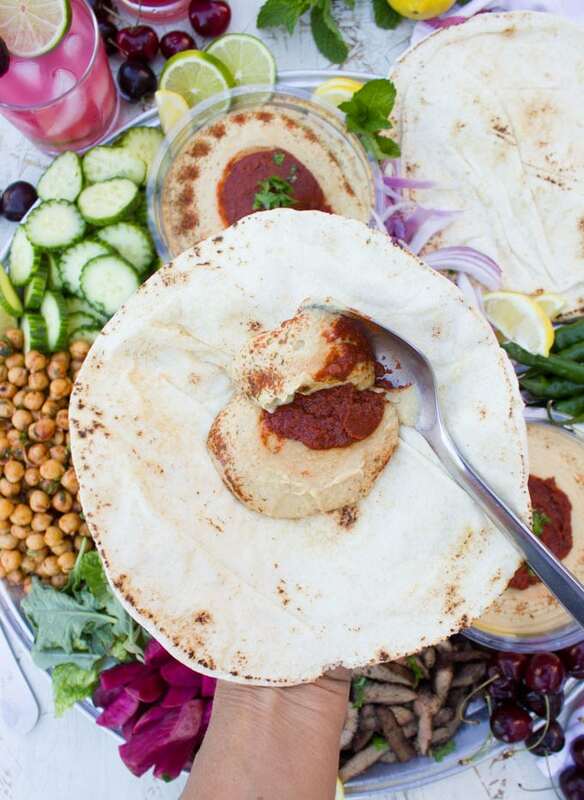 Well you can’t possibly have a shawarma platter without authentic hummus. That’s one thing you certainly can’t skip! I’ve used Sabra’s new limited edition Sweet & Smoky BBQ Hummus with Jackfruit and Smoked Paprika. OMG. Incredibly smoky, creamy with a touch of sweet and a touch of spice. 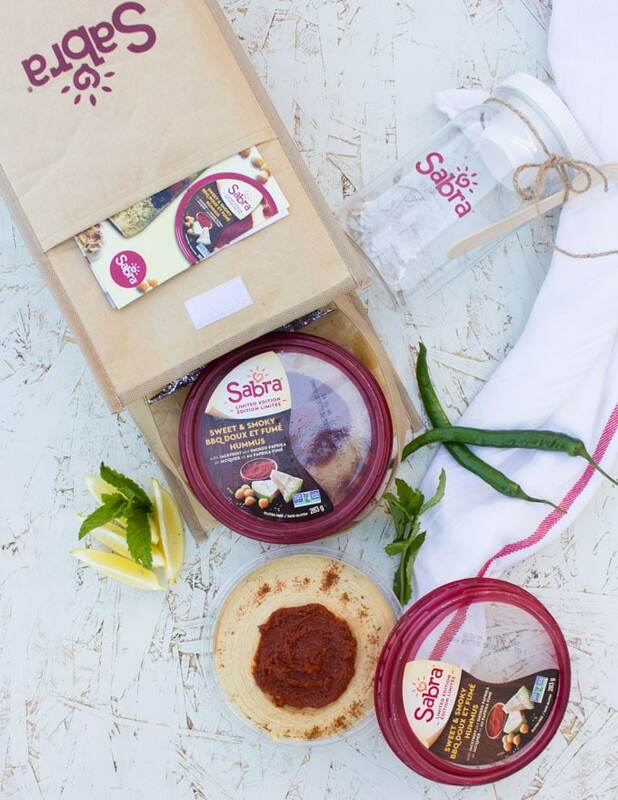 Out of all the hummus brands, Sabra is my absolute pick. Quality and authentic product, since it’s made in the largest hummus plant in the world! How cool is that?! 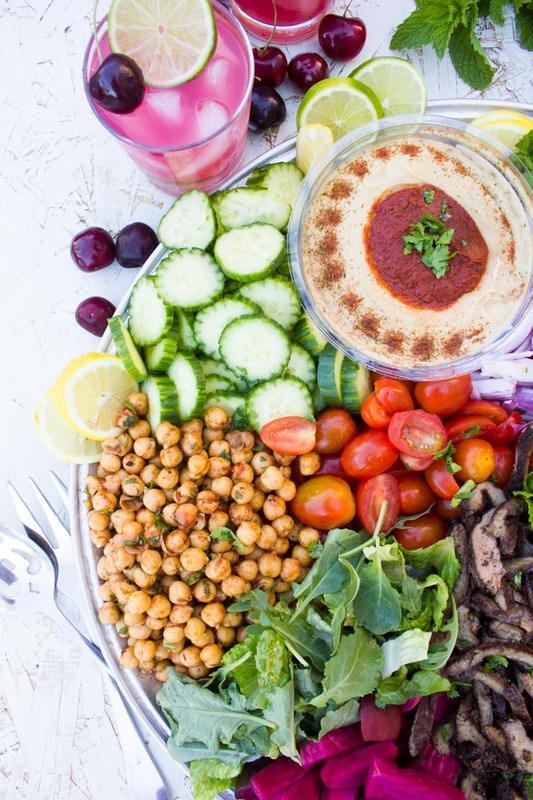 I feel that I can sneak in a container of Sabra hummus with almost every entertaining platter I make this summer! There are so many flavours, some are classic, while others are bold and pack a flavourful punch. Each has its own mood and taste profile. Sabra hummus is like my favourite plant based protein. Now add on your favorite veggies to the platter. I personally won’t skimp on the green chiles (or jalapeños) because my shawarma experience won’t be complete lol. Sliced onions, cucumbers, tomatoes, arugula, fresh mint leaves, lemon slices, pita bread, pickled turnips and beets, these would be my pick for a mouthwatering shawarma platter. If I wanted extras, I would maybe include some feta cheese, tomato salad, olives, tahini sauce and tabouleh salad. The sky’s your limit! Now let’s talk about the shawarma. 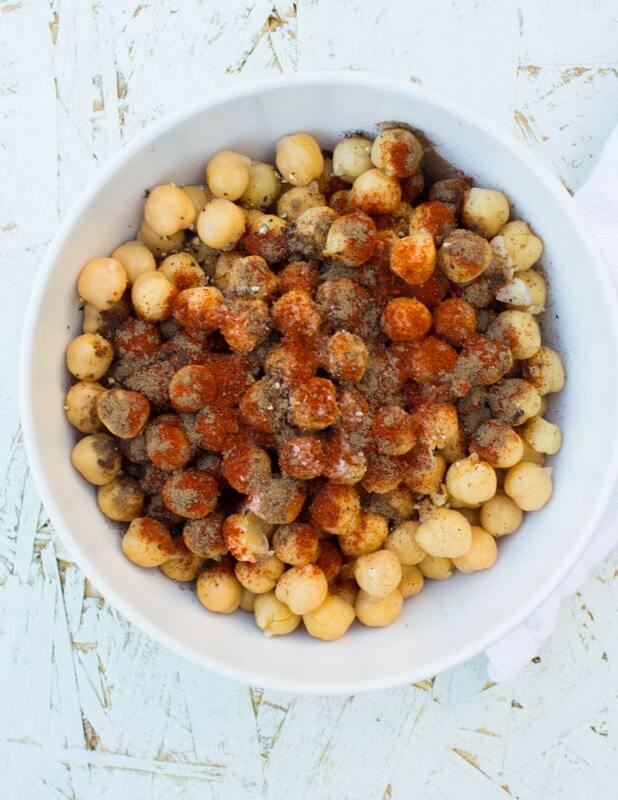 If you’re making the chickpeas, simply toss them with a flavourful blend of paprika, oregano, cumin, nutmeg and herbs. Then add a touch of lemon and olive oil and you’re ready to enjoy! Pick a boneless cut of lamb shoulder and slice that into 1/8th inch slices. Any shape works here, because it’ll get sliced into shawarma pieces anyway so don’t worry about getting perfect looking pieces on the grill. Just try to get them to be the same thickness, because you want them to cook at the same time. Seasoning is everything. Pack your lamb with onion powder, garlic powder, herbs, nutmeg, allspice, cumin, oregano, salt and pepper. Rub the spice into the meat as best as you can and then throw it on a hot grill. 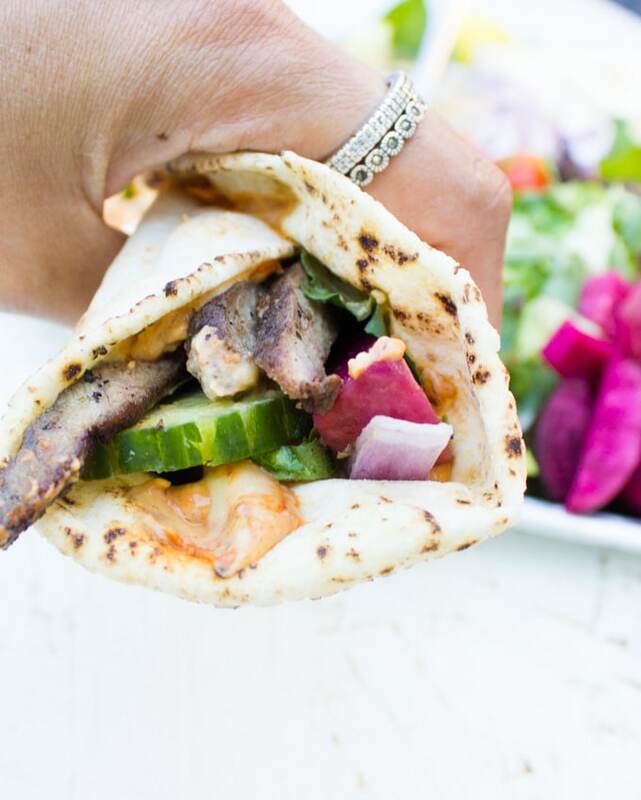 The beauty of this shawarma is you’re not looking for medium, rare or anything tricky. You basically want the lamb cooked through (which is about 30 minutes in total), and then you’ll slice it up into strips. 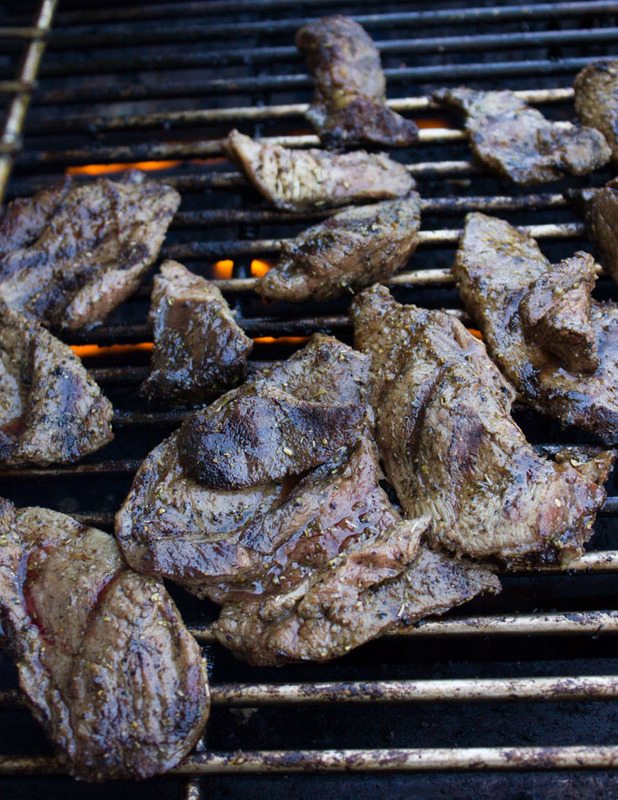 When grilling the lamb shawarma, make sure to sear the slices on both sides to get that nice char on the meat. Then cover up your BBQ and allow the lamb to cook all the way through. Slicing the meat. Try to slice the lamb pieces into almost the same size strips. Always slice the meat in the direction against the grain—this makes your lamb taste succulent and tender. Here’s where you get creative! Start by placing your hero items first, for me it’s the Sabra hummus and the lamb. Then scatter all ingredients around them and try to create a contrast with the colors. The trick is to keep all ingredients at the same height while elevating just a few. These few could be your hero ingredients, or an ingredient that pops with color, an ingredient with an interesting texture or a garnish. Serve this huge platter of shawarma goodness right away! Have your friends make their own sandwiches, or just assemble their own platters using there their favorite ingredient combos. 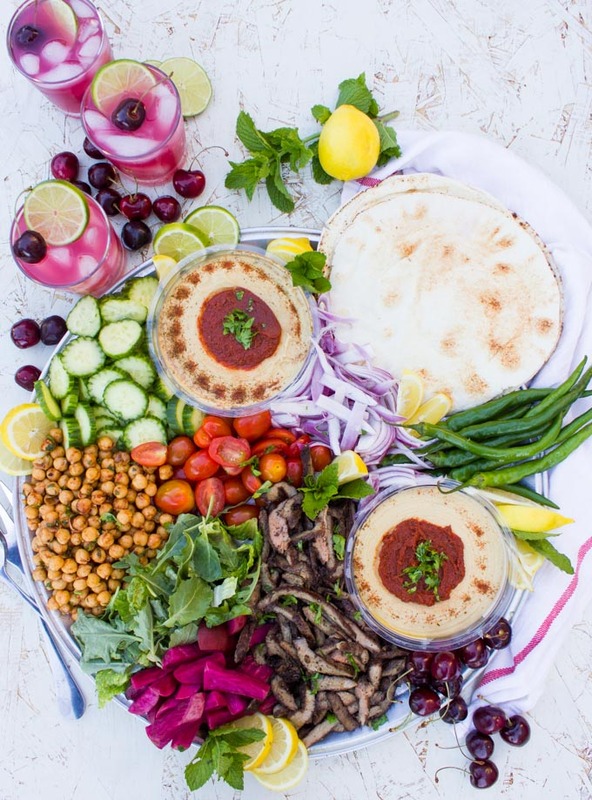 Chicken Shawarma Platter with Tahini Sauce–weekday dinner wonder! Chicken Shawarma Lettuce Cups -Easy healthy and seriously additive! Start by seasoning the lamb. Pat the seasoning evenly over the lamb slices and preheat your BBQ to medium high. Place the lamb slices on the grill for 5 minutes per side until the meat has a nice char on both sides. Lower the heat to low, cover your grill and allow the lamb to cook through—about 15-20 minutes extra. In the meantime, make the shawarma chickpeas. Place all ingredients in a bowl and mix well. You can roast the chickpeas for a crunchy chickpea shawarma or leave it as is for a creamy smooth shawarma spiced chickpea. Gather all the ingredients for your platter. Once the lamb is ready, take it out on a cutting board and start slicing the meat against the grain into strips. The size and thickness of the strips is absolutely to your taste. 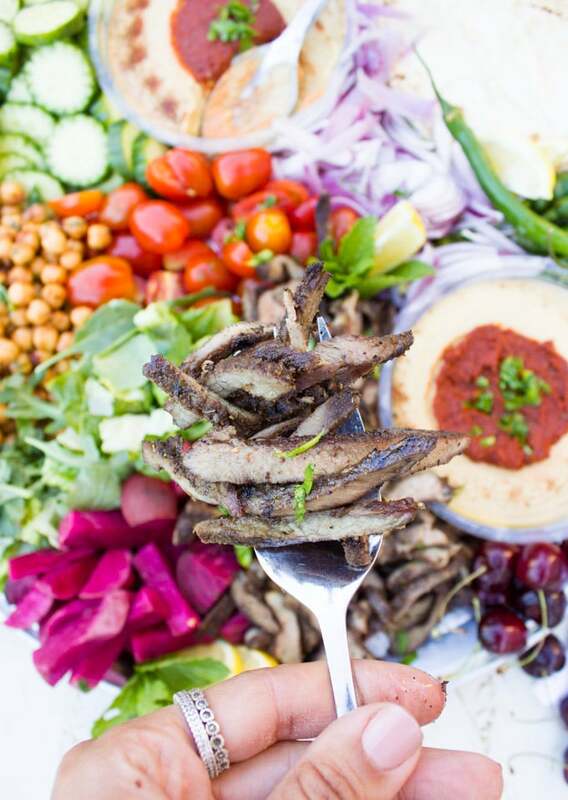 Start assembling your platter by placing the Sabra hummus platters and the shawarma strips. Then arrange all other ingredients around them in the order and color contrast you prefer. Make sure to create some height in your platter, using a few ingredients only. Choose either your hero ingredients, your most colourful ingredients or an ingredient that has texture and highlight that. Serve right away!! Assemble shawarma sandwiches by spreading the hummus on your pita bread and top that with your favorite combo of toppings. 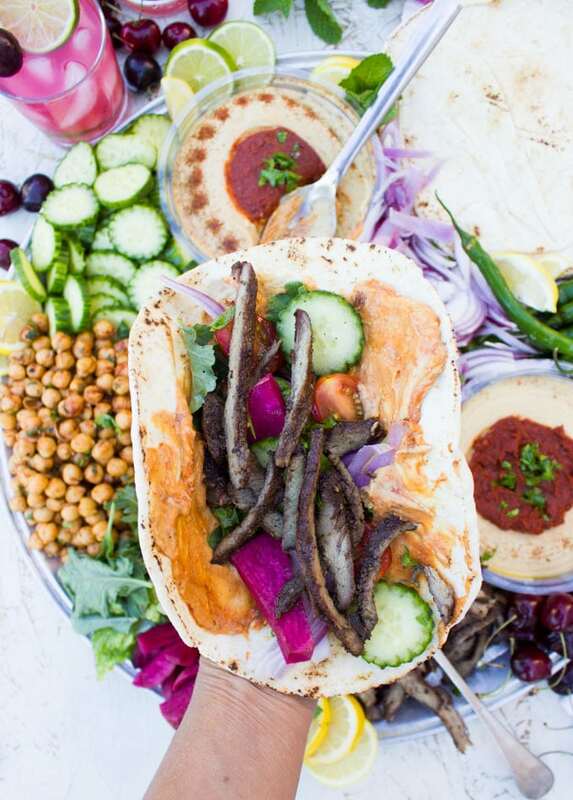 Or arrange your shawarma platter ingredients on a plate without the bread. 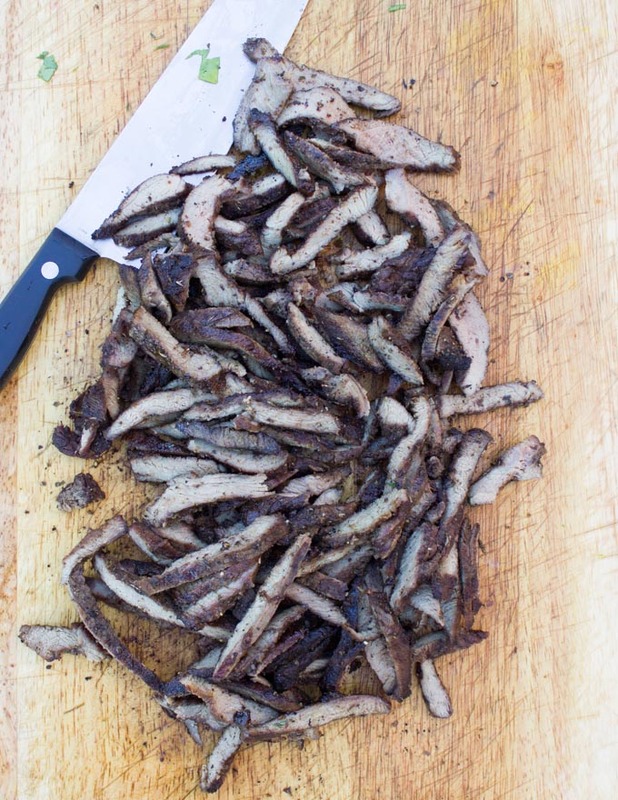 Grilling Lamb shoulder is the best cut to make a grilled lamb shawarma platter. Slice the lamb to thin steaks and season them before grilling. If you're vegan or looking for a vegetarian option, season some chickpeas using the shawarma spices and cook in some olive oil on a stove top until chewy for the same meat effect. The plater toppings and assembly is completely up to you to customize. I love a good serve-yourself platter like this for the summer months. That seasoning blend you used looks spectacular too. I really like the idea of using allspice! This platter looks so inviting and perfect for summer entertaining. I love hummus and that flavor sounds really good. Need to look for that. Also love that you included the vegan option on the platter. It really is inviting and there’s something for everyone! Thanks Stephanie! Which was new for me . That is just a gorgeous platter of goodies! I’m with you I love Sabra hummus! I haven’t seen this new new flavor yet! I’m putting it on my shopping list! The lamb on the grill is amazing!! Thanks Mona! 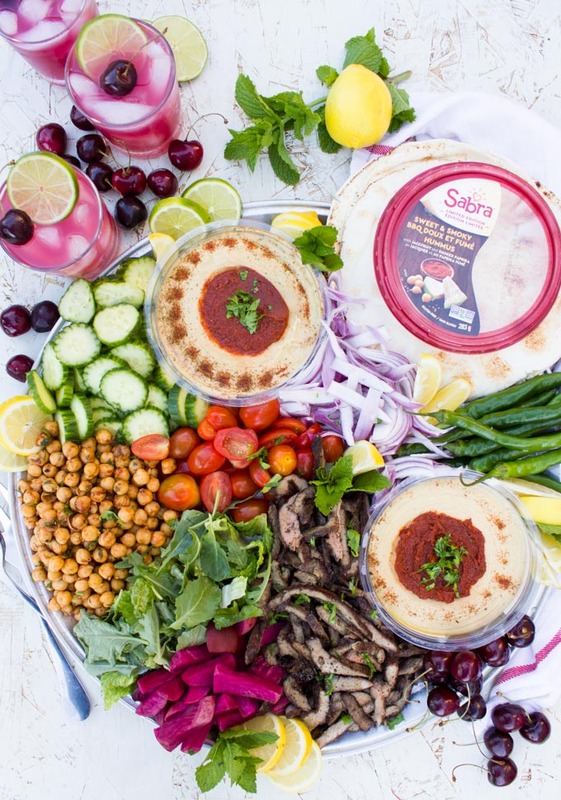 love sabra hummus! this platter is full of everything that I love in the world. YUM! Aren’t they the best?!! Thanks Rebecca–you should make this!! hahahah Catherine I really hope you give lamb another try! Thank you! Thanks Anvita!! Hope you make it soon! I see a party in the making! 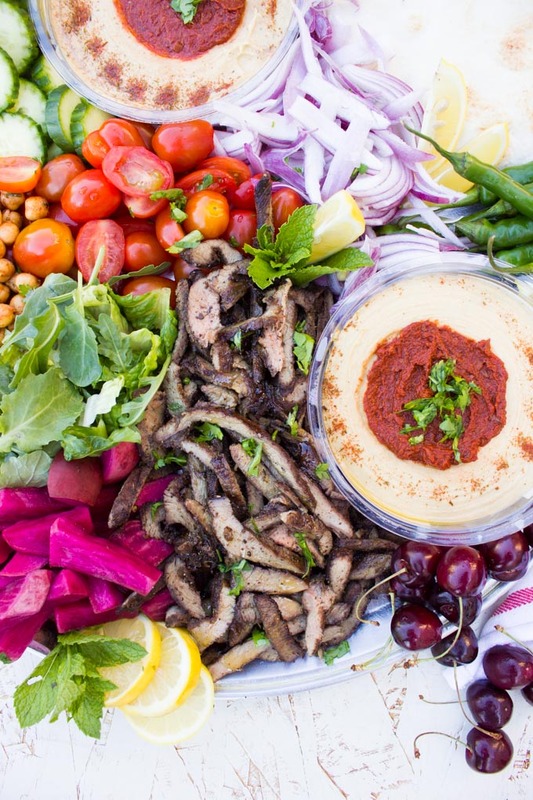 The shwarma platter looks so festive! Such beautiful photos! 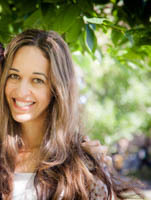 I love lamb but my husband doesn’t eat it, but I know one person who i invite over when I can’t wait any longer for lamb! Your recipe is lovely for the lamb and chick peas. Do you really mean you slice the raw lamb into 1/8 ” slices?